The Deltec flotation unit is designed to treat wastewater with medium solids loading. The capacity of the Deltec unit ranges from 5 to 200 m3/hr. The Deltec serie is designed to treat the wastewater using the Kemeo Platepack System. 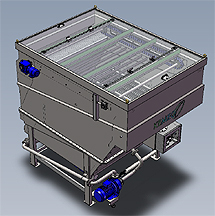 The Kemeo Platepack System multiplies the separation surface for effective separation, making it possible to treat a large amount of wastewater on a small footprint. The solids are collected in the sludge thickener and transported to the sludge cone with a low friction scraper system. The sludge can be discharged with the sludge pump for thickening or discharge. 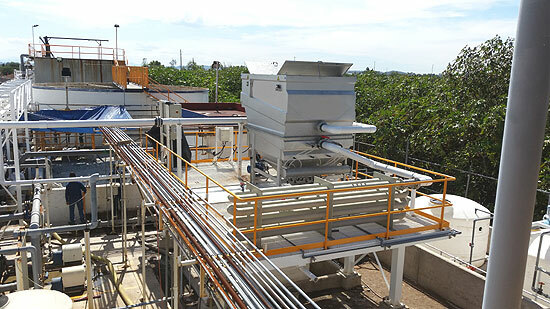 The Deltec+ flotation unit is equipped with a sludge conveyor for discharge of heavy solids. Suitable for medium polluted wastewater, COD up to 4.000mg/l. Very compact design, small footprint compared to capacity. Kemeo Platepack System for optimum separation performance. Efficient sludge discharge system by gravity. Completely manufactured out of stainless steel. Units up to 150 m3/h are suitable for transport in a sea container.